Before the first day of classes, incoming MIT freshmen spent 5 days becoming familiar with life at MIT through the institute’s Freshman Pre-Orientation Program (FPOP), focusing on weather and climate. The program, Discovering EAPS (DEAPS)—offered through the Department of Earth, Atmospheric and Planetary Sciences (EAPS)—allows students to acquaint themselves with each other, the faculty, and its exciting research areas. This year, students chose between two FPOPS offered by the department—a trip to Yellowstone National Park and New Hampshire’s Mount Washington. Enticed by climate and weather experiments, the promise of lively discussions, a beautiful hike up the White Mountains, and plenty of bonding activities, 17 students joined the DEAPS Extreme Weather and Climate FPOP and explored the department’s offerings. “The activities are fun; they will challenge you to think a little bit about what we’re doing,” said research scientist Jeff Scott to the freshmen as they gathered. Measuring the height of the Green Building using classical physics. 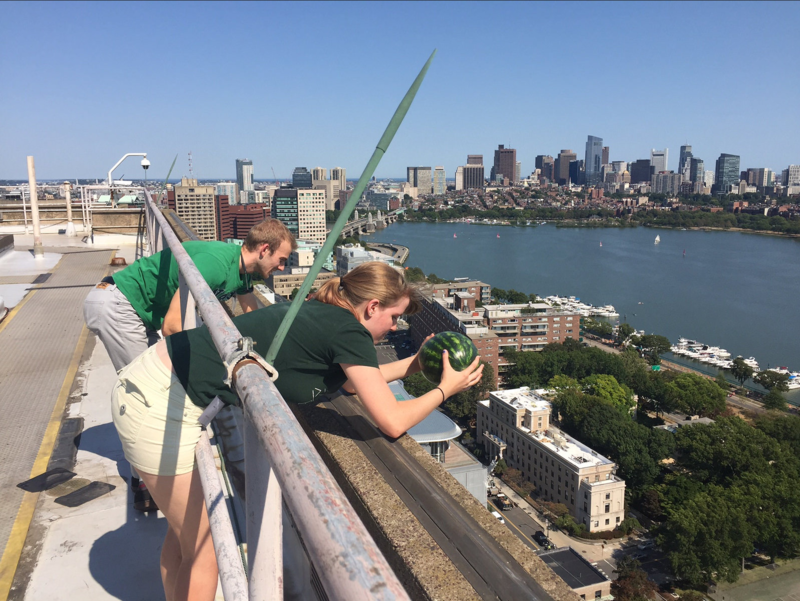 The program kicked off atop MIT’s Green Building, where students—assisted by undergraduate and graduate TAs and faculty—measured the height of the department’s Green Building. Employing methods used by famous scientists Isaac Newton and Blaise Pascal, MIT oceanographer John Marshall and Jeff Scott introduced students to elements of classical physics to size up the structure. The students looked at two different methods and compared them. Pascal’s relies on the hydrostatic equation. To do this, students measured the air pressure at both the top and the bottom of the building; the difference between these yields the height of the building. Next up was Newton’s method, which was arguably much more fun, as it required dropping fruit from the top of the Green Building and timing their fall to impact. From this, the freshmen calculated the height using gravitational acceleration. Afterward, the group shared their results and provided possible reasons for any biases or discrepancies in the measurements. 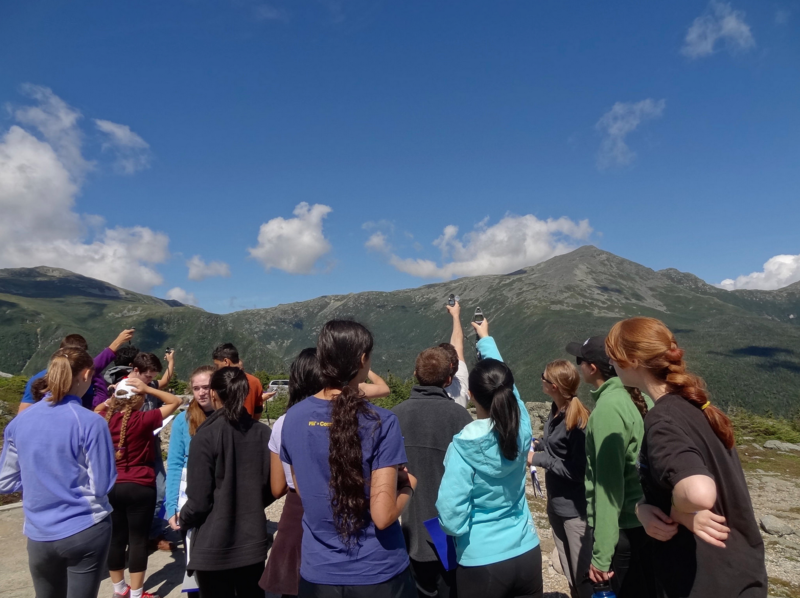 While on the roof of the Green Building, the freshmen got a taste of the meteorology that they would be conducting later up on Mount Washington. 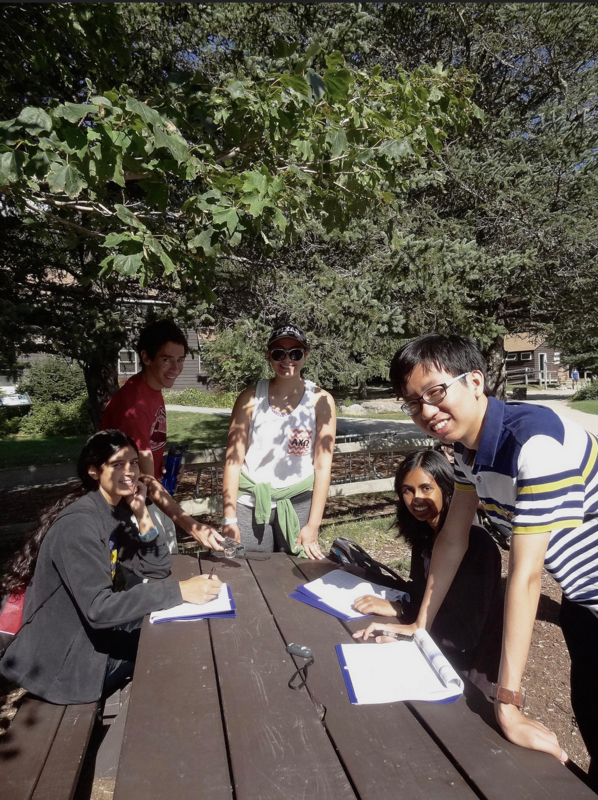 Graduate TA’s Dan Rothenberg, Rohini Shivamoggi and others instructed the freshmen on weather and how to take observations of clouds, atmospheric temperature, wind speed and direction. At the end of the day, freshmen and the staff dined at a local restaurant, Fire and Ice and later went for ice cream, where they had an opportunity to see the town and ask questions about the MIT culture in a relaxed setting. Over the next two days, students discussed climate and extreme weather phenomena, as well as investigated some of the principles behind their study. 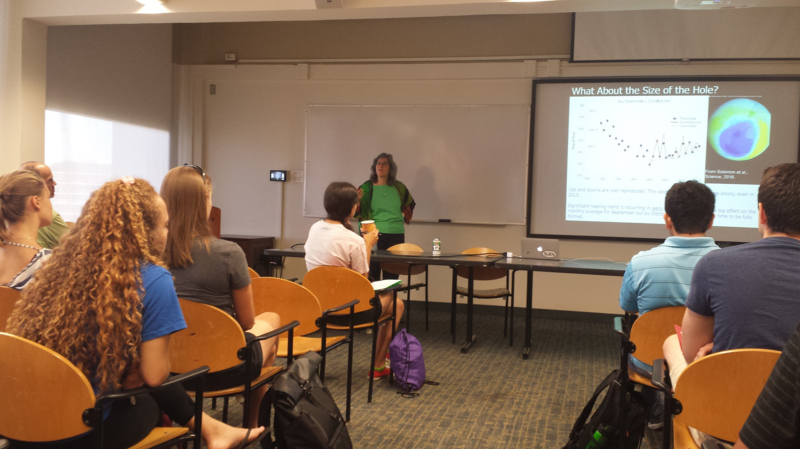 Atmospheric chemistry professor Susan Solomon led off with her work on the Antarctic ozone hole. As one of the world’s foremost experts on this issue, Solomon imparted how her research experience was able to influence environmental policy, in this case, the creation of the Montreal Protocol, which banned the use of ozone-depleting CFCs. Hers, along with the research of many other climate and environmental scientists, has ultimately helped the ozone to begin healing. Solomon emphasized the importance of 3 phases to solving this and many environmental problems, which affect large populations and how actions can help avoid an environmental tragedy of the commons case. First, credible research should show that there is an issue that needs addressing. Individuals and groups can then unite to devise a solution, and lastly, they should follow through and be held accountable for their part of the solution—each step founded upon solid science. This sparked the interest of many curious freshmen. 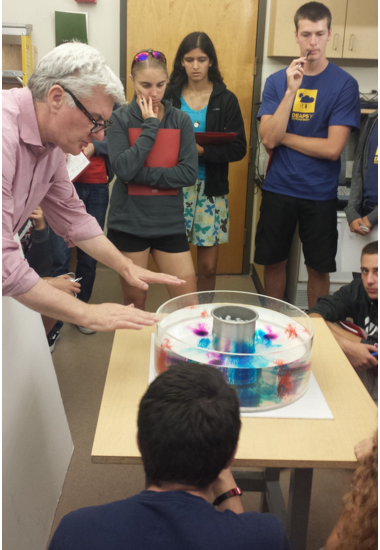 Enthusiasm from Solomon’s talk carried over into the synoptic lab and the classroom where students used data from historically large storms like 2008’s hurricane Bertha and 2012’s Hurricane Sandy to mathematically characterize and explore some basic fluid dynamics of vortices. 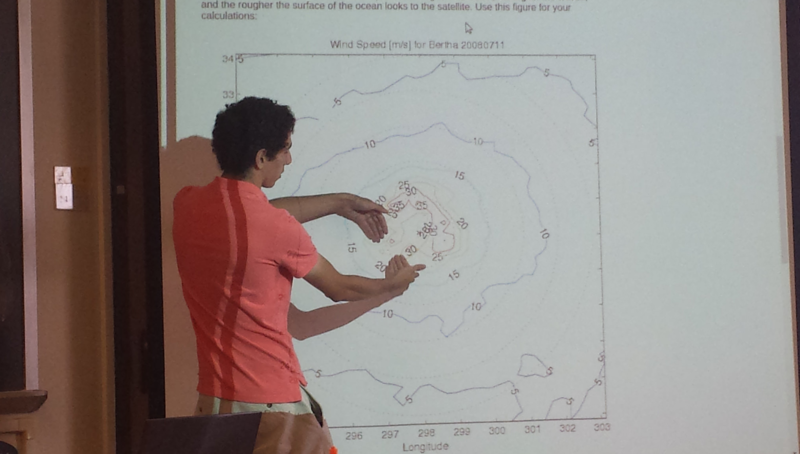 PhD candidates and FPOP TAs Vince Agard and Rohini Shivamoggi, who respectively focus on atmospheres and hurricanes, explained how forces like the Coriolis force, the pressure gradient force and centrifugal force act in conjunction to affect a hurricane’s strength and direction. In the lab, Marshall reinforced these concepts by introducing the group to ocean and atmospheric circulation with “Weather in a Tank.” Here, tanks of water, each with an ice bucket in its center, sat on a rotating table, and a camera, locked to the tabletop, looked down on the tank. MIT EAPS professors utilize this tool to help introduce ideas like the Earth’s rotation and influence on fluids, timescale, how storms may develop, and perspective from a geostationary satellite. Gathering around 3 of these tanks, students witnessed the evolution of different convection patterns and currents in the water. “The key to good research is to have a good question and a good hypothesis,” said Jeff Scott as the freshmen sketched their circulation predictions for each of the tanks. Moments later, the tanks began spinning at various speeds: no rotation, slow and fast. Water with drops of dye swirled in the tank—revealing cold water to be sinking near the ice bucket, which represented the Earth’s poles, and warmer water rising near the edge of the tank (the equator). Features like Hadley cells, a subtropical jet stream and overturning circulation emerged allowing the freshmen to see how these components could affect weather and storms. While on campus, MIT EAPS faculty and students gave punctuated lectures on their research, providing incoming students with a deeper look into the department’s inner workings; in particular, a talk from astronomer and planetary scientist Amanda Bosh piqued the interests of the group’s astronomy enthusiasts. Exoplanets, OSIRIS-REX—a mission to study and sample 101955 Bennu, an asteroid that might impact Earth, SOPHIA—the stratospheric observatory for IR astronomy–were just some of the exciting projects in the department that Bosh touched on, and programs like Observe@MIT encourage the MIT community to become amateur astronomers during observation sessions guided by EAPS scientists. 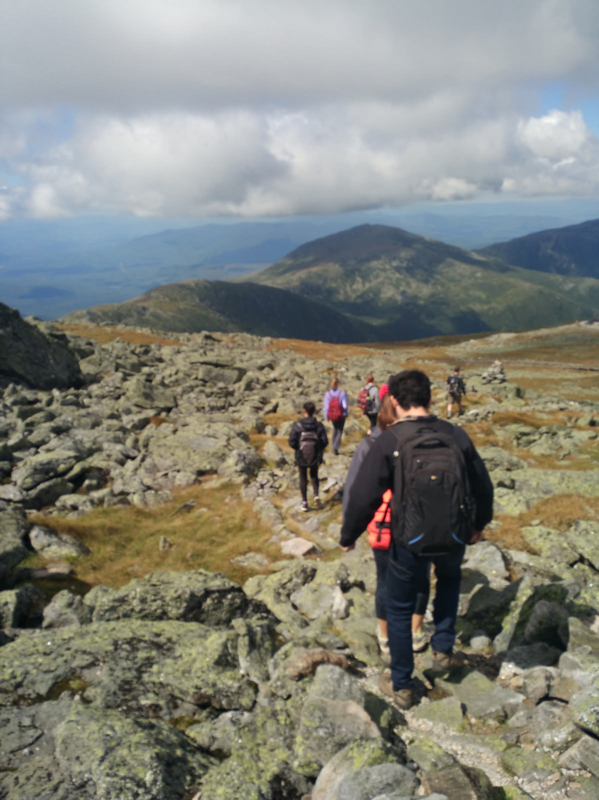 The DEAPS program culminated with a hike up the White Mountains to the summit of New Hampshire’s Mount Washington—an event that students were greatly looking forward to. Breath-taking views, varied and erratic weather, diverse ecosystems and complex geological structures were just some of the features that regularly draw Earth scientists and the public alike to the highest peak in the Northeast. Here, Mount Washington served as an exciting outdoor classroom, where the students applied lessons from the previous days. “Going up the altitude on Mount Washington, is actually a really good proxy for going towards the pole in terms of ecosystems that you see,” said Dan Rothenberg, an EAPS PhD candidate and resident ecologist and meteorologist. “So the overarching theme of the exercise that we do on the mountain is to observe the changes in meteorology and ecology and relate them to how you might expect climate to have an influence on ecology.” To do this, the group began their ascent at Pinkham Notch, gathering meteorological observations near the base of the mountain in one of its transition zones, characterized by birches and fir trees. While driving up the mountain, they noted changes in the flora and fauna, periodically stopping along the way up to take more measurements. At the halfway point, the DEAPS group had nearly reached the tree line. “All the plants are very close to the ground, like it’s mosses and flowers that have very short stalks and stems. And all the trees are exposed to high winds and ice in the winter, so they get tangled into these grotesque patterns,” said Rothenberg. Once at the top, students experienced alpine and tundra-like climates surrounding the Mount Washington Observatory, a place that boasts that they’re “Home of the World’s Worst Weather,” and toured the facility. From the Observatory, the freshmen began traversing the steep and rugged terrain down 1,200 feet to the Alpine Gardens plateau, taking meteorological measurements and observations on the way. During the descent, Max Collinet, an EAPS graduate student specializing in petrology, mineralogy and geology, provided a running narrative on subduction zones, continental drift and weathering that have affected the mountain. Upon arrival, Rothenberg added details on plant adaptations—how mosses and lichens had developed to survive there—and how different cloud layers form, like the cirrus and mountain cloud layers that had rolled in during the hike. 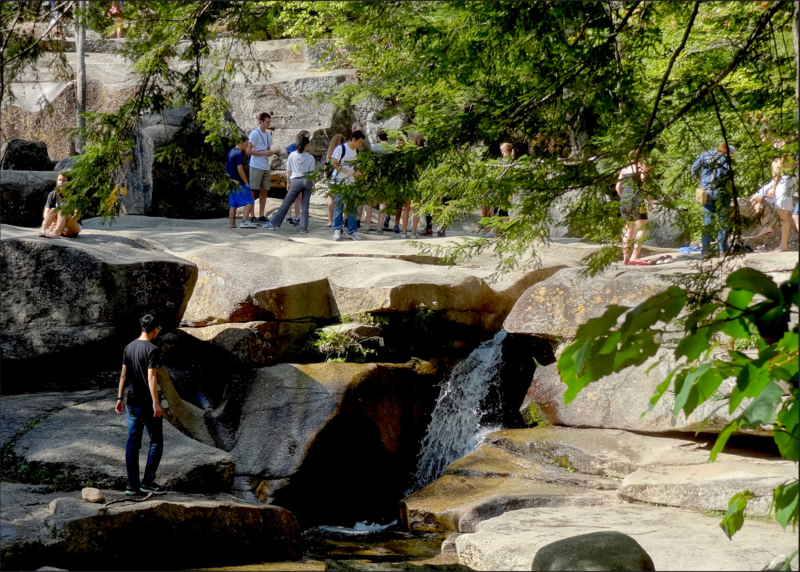 After overnighting at the Fox Ridge Resort, the cohort ventured to Diana’s Baths, near North Conway in New Hampshire—taking in the beautiful sights of the waterfalls and last geology lessons—before returning to campus later that day. EAPS’ lecturer and meteorologist Lodovica Illari coordinates the Mount Washington DEAPS FPOP. See more photos from the DEAPS Yellowstone and Mt. Washington trips.